Sheelagh has had a life-long interest in posture and gravitated toward history and anthropology at the University of Victoria where she completed her BA in History. After a year travelling, she returned to Canada to complete the 3,000 hour Massage Therapy Programme in Victoria, BC. At massage therapy college, she was taught how to assess posture but not taught how to help her patients correct it. 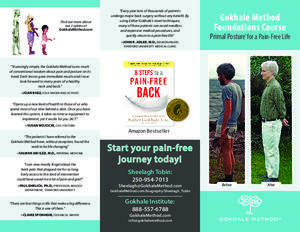 After years of patients returning with the same posture-related complaints, she discovered the Gokhale Method by chance and was immediately struck by its anthropological and historical perspective and its eloquence and simplicity. Sheelagh especially appreciates the hands-on approach and small class size that give students one on one attention and the tools to easily incorporate the 8 steps into their bodies and improve the quality of their lives. Sheelagh is excited to offer classes in beautiful British Columbia but would also consider venturing further afield.